If you find yourself wonder “Where are all the coin shows near me?” Then is the answer for you! This coin show has been going on for 61 years! Free admission and free parking! Come check out all the coins, currency, gold, postcards, stamps, silver supplies, and trading tokens! 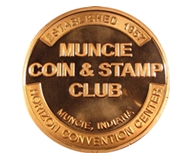 Here is a link to the Muncie Coin & Stamp Show Facebook. Check that out for updates and more information! Here is a list of all of the listings we have for Indianna. Here is where you can list upcoming coin shows!